The Mekong Institute (MI) with support from the government of Republic of Korea has implemented a project on ‘Certified Logistic Master in the GMS’. The project aims to decrease cross-border logistics costs, improving logistics services quality and timeliness in services delivery of national logistics providers in the GMS and assist the national logistics providers in integrating into regional and global logistics chains. The GMS Logistics Database is a part of the Logistics Development project to introduce an interactive web-based database platform for logistics companies with the mobile application system.  B2B and B2C e-platform to conduct online business among logistics operators. 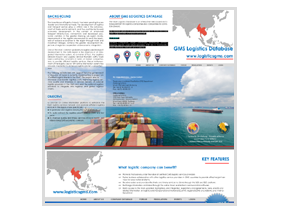  Database of logistics companies for Instant online communication through web and mobile application to facilitate business networking among logistics operators in the GMS countries.  News and events and related information on transport and logistics.  Available on mobile devices to facilitate timely and efficient logistics services.